Selling your house can be a stressful experience - you worry about getting the right price, about finding a new place, about your Great Aunt Cathy’s ancient crystal dinner set getting smashed to bits in the move. You want to go through the process of selling your home with someone you can trust - so choosing a realtor may not be as straightforward as it sounds. As a general rule of thumb, you should meet with at least two or three agents to find the one you click with best. And when you do meet them, here are some things to keep in mind to make sure you’re making the right choice. What does a real estate agent do for you? Giving you access to market data in your area. Putting you in contact with a large number of buyers. Screening those buyers for serious prospectives. Giving advice on the marketing of your home and then implementing an effective sales strategy. This might even include recommending a house stager, so your home looks as salable as possible. Negotiating between you and buyers to get you the best sale price, as well as a settlement that meets your needs in other ways. For example, you may want an extended settlement, so you have a chance to buy another home before moving out. Handling of the legal and administrative work. Someone’s got to do all the paperwork! First and foremost, you want a real estate agent who will find you the best possible selling price for your home. You want to find a good match for you, who will be honest and want the best for you. A clear interest in meeting your needs. You don’t want to deal with someone who is flippant or uncaring of what you want. The ability to meet your requests, and not talk their way around them. Remember that you’re the boss of your house sale - so although it's a good idea to take into account your agent’s advice, they should be doing what you need them to, not imposing their own opinions on what is best. Positive recommendations. Whether it’s from your friends and family or from reviews left on their website, make sure you get opinions on an agent from people who have worked with them before. There’s nothing better than real life experience. Last but not least, look for an agent who you get along with. Sounds kind of obvious, but the process of selling your home can be a long and involved one - you want to go through it with someone you don’t dread seeing on the doorstep. How long have you worked in real estate? Make sure they have the experience behind them to know all the tricks of the trade. How long have you worked in this area? A slight twist on the above - local knowledge can be a big boost to selling power. How much do you charge? Best to get this one out of the way straight up. 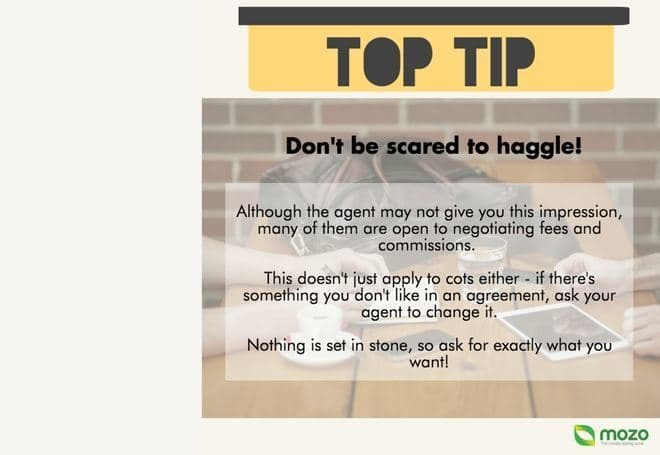 And once you choose an agent to work with, don’t be afraid to haggle! Can you give me the contact details of previous clients? Not only will this give you the chance to hear the opinions of people who’ve worked with the agent before, but their willingness to give out details may give you a clue about how satisfied previous clients have been. What price would you put on my property at the moment and why? This one can be tricky, and many agents will avoid answering it. And even if they don’t, they may not have a good answer - it’s the nature of the market. And the number one question you should ask…. What will you do to help sell our house? This will give you an insight into the kind of marketing and help you’ll receive from an agent during the selling process, and can be a lot more telling than asking for a valuation of the property straight up. You’ll be able to gauge the level of enthusiasm and helpfulness of an agent this way. The big question on your mind when getting ready to sell your property will usually be: how much is it worth? You might be relying on your realtor to answer it for you, but there are a couple of reasons why that may not be ideal. Firstly, if the real estate agent knows they are competing against others for the chance to sell your property and therefore earn commission on it, they may over-quote you, in the hopes that a higher selling price will entice you to choose them. The other problem is that a real estate agent could rush a sale in order to get the commission and not take the time to wait for better offers to come in. If you don’t know the value of your property, you might be inclined to accept an offer that’s lower than your home is worth, on the recommendation of an agent. A good way to solve these problems is to first have your home valued by an unbiased third party - a property valuer. The valuer has no financial stakes in the selling price of your home because they get paid no matter what value they put on it, so you’re likely to get a more accurate price estimate from them. Although it may seem like a needless expense - and if you have a good idea of the market value of your home anyway, it just might be - having your property value can lay the groundwork to making sure you get the right price for your home later on. Generally speaking, a real estate agent will charge 2-3% of the sale price as commission. This usually doesn’t include things like advertising costs, which instead are charged as a separate fee. How much that will cost will depend on the marketing strategy you agreed upon with your agent - what kind of ads were put up, where they were, how long they were up for. ‘No sale, no fee’ If your house doesn’t sell, you don’t pay for advertising or signage. On the other hand, you might be charged for marketing regardless of whether the property sells. Low, flat fees. Be careful with agents charging a single, low fee, that they aren’t pushing for a quick sale just to get the commission - you may not get the best price for your home this way. Scaled commission. This is an agreement that the higher the selling price for your home, the bigger a commission your realtor gets. For example, they may earn 2% up to $500,000, and then 5% if the house sells for more than that. This can be a useful way to make sure your agent is pushing for the best possible sale price. Once you've picked the best real estate match for you, the next step is to sign an agreement and get the ball rolling on the sale of your home. The important thing here is to take your time and make sure you understand what you’re getting yourself into before you sign anything. A good real estate agent won’t mind giving you the time to think over your options before making a decision. Open listing or general authority. Variety is the spice of life - and why not apply that rule to selling your home? Also known as multi-agency agreements, this means that you can list with any number of agencies. The more agents you have working to sell your property, the wider pool of potential buyers it reaches. The good news is that you only pay commission to the agent who sells your property. The bad news? You will usually pay higher fees, and you run the risk of agents pushing a quick sale to get the commission, rather than looking for the best price. Exclusive agency. This means the realtor has exclusive selling rights and will be paid commissions and fees upon sale of your property, even if you make the sale yourself, or through a different agent. Sole agency. This is more or less the same as exclusive agency, except the your agent won’t necessarily be entitled to a commission if you make the sale of your property yourself. Hidden fees. Make sure you know what is included in the agent’s fee - for example, does it include advertising? - and make sure you’re aware of all the fees and charges. Be wary of signing agreements with handwritten changes - some agents will use this method to slip in extra marketing fees. Exclusive selling rights. Avoid agents who insist on sole selling rights, because it means that even if you find a buyer yourself, you’ll have to pay the agent’s fees anyway. If you do give away sole selling rights, make sure it's only for a limited time. ‘Ready, willing and able’. Some agreements will commit you to paying the real estate agent for finding a ‘ready, willing and able’ buyer, even if for some reason the sale falls through on your end (for example, if you lost your job). Use a realtor who only expects to be paid for a completed settlement.